Owners of Redhill airfield, RAVL, have submitted a revised application for a hard runway after their first bid failed. They want to replace the 3 grass runways with a one concrete one, giving it potential to increase flights from 60,000 to 85,000 a year and for larger planes. Tandridge and Reigate councils turned down the original bid last year. The airfield think their new application “addressed the reasons for refusal in 2011”. As usual, they exaggerate the number of possible jobs that might be created – alleging it will increase the 450 jobs it supports today to some 590 in future – and attract investment to the area etc. Over 1,000 people opposed the original plans which were rejected last year, realising the plans would create an unacceptable level of noise and pollution, breach green belt restrictions, and destroy the landscape. The owner of a Surrey airfield has submitted a revised application for a hard runway after its first bid failed. Redhill Aerodrome wants to replace its three grass runways with a concrete one, giving it potential to increase flights from 60,000 to 85,000 a year. Tandridge and Reigate councils turned down its original bid last year. Aerodrome boss Jon Horne said this new application addressed the reasons for refusal in 2011 and the firm was confident it would be successful. Mr Horne said the company had spent over two years listening to people’s views and had sought to address their genuine concerns. The revised application included minimal change to the landscape, reduced noise impact, and proposals to improve road safety and public transport connections, he added. And he said the planned hard surface area had been reduced by 25%, but in other respects the application remained the same as that submitted in 2011. He said the councils would carry out consultation and a decision was not expected before November. More than 1,000 people signed a petition against the original plans which were rejected last year. Opponents said the new runway would create an unacceptable level of noise and pollution and destroy the landscape. 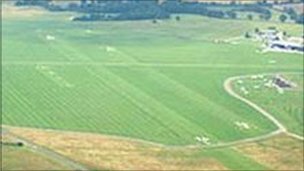 The owners of a grass airfield in Surrey are to submit a revised application to build a hard runway. Tandridge and Reigate and Banstead Councils turned down its original application in 2011. Aerodrome boss Jon Horne said the new runway would create 170 new jobs and bring economic benefits. Mr Horne said the new plans would see the width of the proposed runway reduced, improved road safety and transport provision and better landscaping. He added: “We have spent five months considering what the best course of action would be in respect of gaining approval for a hard runway at the aerodrome. “Not only will this secure the existing 450 jobs supported by the aerodrome, but we believe it will lead to the creation of at least another 170 jobs over time as well as support and encourage other economic activity and regeneration in the local area,” he added. More than 1,000 people signed a petition against the original plans which went before Tandridge and Reigate and Banstead councils in November and December 2011. Opponents at the time, including East Surrey MP Sam Gyimah, said the new runway would create an unacceptable level of noise and pollutionand destroy the landscape. The owners of a grass airfield in Surrey are considering appealing after a second local council turned down an application to build a hard runway. Tandridge planning committee refused permission on Thursday, three weeks after Reigate and Banstead Council. Aerodrome boss Jon Horne said it believed it had a robust case. The aerodrome, which is home to more than 20 companies employing 350 people, has been in operation for about 80 years. Its green belt site straddles the border between Tandridge and Reigate and Banstead. A study carried out for Redhill Aerodrome Ventures Ltd (RAVL) showed the development could create 170 jobs and bring £8m a year into the local economy. Opponents, including East Surrey MP Sam Gyimah, said the new runway would create an unacceptable level of noise and pollution and destroy the landscape. Mr Horne said a decision on whether to appeal would be made fairly quickly. “We are not going to let the grass grow under our feet,” he said. The owners of a grass airfield in Surrey have said they may appeal after a planningapplication to build a hard runway was turned down. Reigate and Banstead Council turned down the plan this week. It goes before Tandridge planners on 15 December. Aerodrome boss Jon Horne said it would then consider whether to appeal. “We are not ruling anything in or out at the moment,” he said. Its green belt site straddles the border between Tandridge and Reigate and Banstead, whose councillors turned down the application by nine votes to seven. Mr Horne said his company, Redhill Aerodrome Ventures Ltd, (RAVL) was disappointed but the vote was close. “We still believe we have a very strong case for putting the runway in place,” he said. A study carried out for RAVL shows the development could create 170 jobs and bring £8m a year into the local economy. More than 1,000 people signed a petition against the plans. “The green belt is about openness,” said Chris Hoskins, of Nutfield Conservation Society. “These proposals would start developing the green belt. The owners of a grass airfield in Surrey have said they plan to submit an application to build a hard runway. Redhill Aerodrome, near South Nutfield, is to apply for planning permission to replace its three grass runways with a Tarmac one to allow all-weather flying. Many local residents are against the scheme, which they fear will lead to further development on the site, which occupies greenbelt land. The airfield is home to more than 20 companies, employing about 350 people. Chris Hoskins from the Nutfield Conservation Society said: “The main concern is it’s a greenbelt site. Jon Horne, chief executive of Redhill Aerodrome Ventures said: “Currently there is no limit [on the number of flights] but we have said we will enter a planning agreement that would limit flights to 85,000 in any one year. The aerodrome said it would submit the application in July and would not expect a decision until November at the earliest. Plans to build a hard runway at a Surrey airfield to replace three existing grass runways are to go on show to the public. Redhill Aerodrome’s master plan for the controversial green belt land five miles north of Gatwick, is the latest in a series of proposed developments. Chief Executive Jon Horne said the runway would create a modern airfield that would secure jobs at the site. But Keep Redhill Airfield Green (KRAG) campaigners said it was not necessary. The airfield is home to 23 businesses, including Bristow Helicopters, providing more than 300 jobs. Redhill Aerodrome Ventures Ltd (RAVL) has made several unsuccessful planning applications since it bought the site in 1991. Mr Horne said RAVL did not want to increase the size of the airfield, which was not subject to any planning controls on the number of flights it could operate. With a hard runway, it hoped to return to the 100,000 movements a year common in the late 1990s. “The scale of the change that we are seeking is minimal,” he said. “The open aspect of the green belt is not going to be altered. KRAG spokesman Peter Charman said the fundamental issue was development in the green belt. “A large percentage of the aircraft movements are helicopter movements that don’t require a hard runway,” he said. An exhibition of the master plan is being held at the aerodrome on 8 and 9 October, with RAVL asking for comments from the public by 31 October. A final version will be published by the end of this year ahead of a formal planning application. Plans to improve an airfield in Surrey are going on display to the public amid controversy over whether the land is suitable for housing. The owner of Redhill Aerodrome, Redhill Aerodrome Ventures Ltd (RAVL), wants to build either a year-round airfield or a 2,000-home village-style estate. MPs Crispin Blunt and Peter Ainsworth say housing would breach the greenbelt. But RAVL spokesman Paul Dimoldenberg said it would be up to the local councils to make a final decision. One proposal is to replace the grass runway with a 900m hard runway, improve the control tower and build a new passenger terminal. That scheme goes on public display on Thursday at the Aerodrome Cafe. RAVL has already held a public exhibition on the other option, for the 2,000 new homes. But MP for East Surrey, Mr Ainsworth, and MP for Reigate, Mr Blunt, turned down an invitation to a workshop to consider the design of the new village. “We believe such a development would be a fundamental breach of greenbelt policy as well as yet more development on an already overloaded local infrastructure,” said Mr Blunt. Housing Minister Yvette Cooper confirmed in a letter to the two MPs last month that the airfield was greenbelt. “There is no presumption that previously-developed land is suitable for housing,” she said. RAVL has not yet submitted formal planning applications to the Reigate and Banstead and Tandridge councils. “It is a work in progress,” said Mr Dimoldenberg. “We believe it is a brownfield site and something for the local authorities to decide. It could eventually lead to appeal.”ceptable level of noise and pollution and destroy the landscape. Posted: Tuesday, July 31st, 2012. Filed in News about Airports, Recent News.